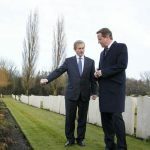 On 19 December 2013 Taoiseach Enda Kenny and British Prime Minister David Cameron jointly visited a number of First World War graves and memorials in Flanders, Belgium this morning. Both leaders paid their respects to those soldiers killed in the First World War at a number of cemeteries and memorials administered by the Commonwealth War Grave Commission (CWGC). 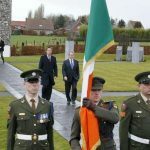 The Taoiseach and the Prime Minister visited a number of locations where the British Army had engaged in combat. Irish troops had also participated in the fighting in these locations, and many were numbered amongst the casualties. 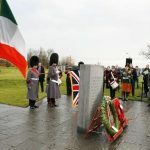 The visit included the Island of Ireland Peace Park at Messines which is a memorial to the 50,000 Irish war dead; the grave of William Redmond, MP, the brother of John Redmond. He was originally commissioned as a captain in the Royal Irish Regiment, with whom he served 33 years, but re-enlisted and fought on the Western Front with the 16th (Irish) Division, in the winter of 1915-16; the village of Wytschaete where the 16th (Dublin) and 36th (Ulster) divisions advanced together and fell in the attack on Messines Ridge; the Menin Gate Memorial, dedicated to British and Commonwealth soldiers whose bodies were never recovered; and Tyne Cot Cemetery, the largest cemetery for Commonwealth forces in the world, for any war, with over 12,000 burials. To watch the RTE report on the visit, from Century Ireland, click here. From History Ireland: Tom Burke on the battle of Wijtschaete and Messines Ridge. 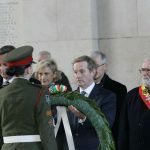 From History Ireland: Edward Madigan on commemoration during the 2011 Royal visit.